The UBC Okanagan Integrated Rainwater Management Plan has been developed to responsibly manage the rainwater that falls on campus. 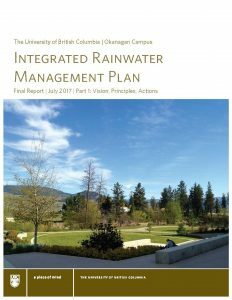 Endorsed by UBC Okanagan’s Senior Executive in 2017, the Integrated Rainwater Management Plan (IRMP) was developed in response to a key recommendation of the UBC Okanagan Whole Systems Infrastructure Plan (WSIP, 2016), which recommended an update to the 2011 Stormwater Master Plan to reflect the UBC Campus Plan (2015). 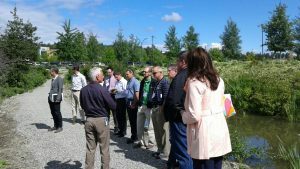 The resulting IRMP was designed to responsibly manage the rainwater that falls on campus and to sustainably accommodate the future growth of the campus in a way that respects natural hydrological processes, protects existing environmental values, and manages risk.